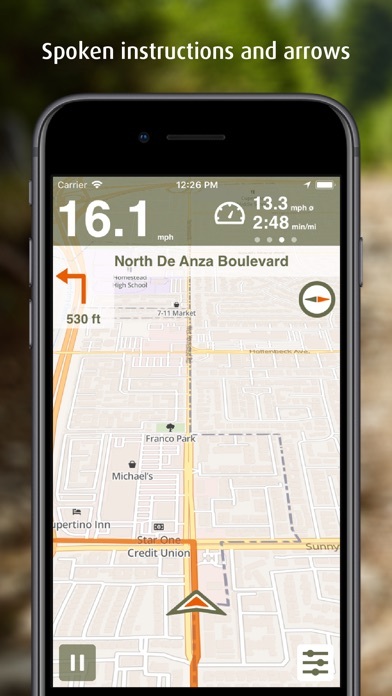 Optionally for everyday, leisure, mountain bike and racing bike Naviki provides ideal connections between any start and destination addresses, it immediately shows your routes on a map and navigates to your target by spoken navigation instructions and arrows on the display. Naviki easily records your own trips and synchronises them with www.naviki.org. The result is an impressive personal collection of routes! Simple and practical: Plan routes on www.naviki.org and transmit them to the App by just one click. 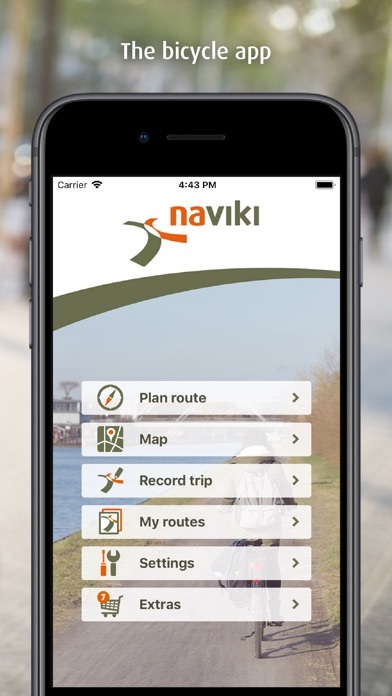 Naviki’s most important functions at a glance: ROUTE PLANNER Simply enter your start and destination, immediately get your customised route with the most important additional information. TURN-BY-TURN NAVIGATION Spoken instructions and pleasantly large navigation arrows on your display. By means of spoken instructions, the phone can remain in your pocket which is energy-saving. Spontaneous deviation from a planned route is no problem - Naviki automatically calculates a new route to your destination. EVERYDAY ROUTING Gives you the cycle tracks for your daily activities. Prefers minor roads, bicycle lanes, rather short and straight routes as well as easy accessible and solid surfaces. 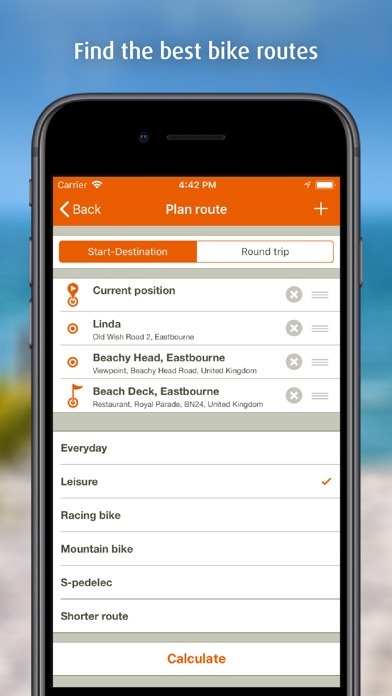 LEISURE ROUTING Your cycle routes for tourism and leisure activities. Prefers officially signposted cycle tracks, easy accessible and solid surfaces, minor roads and a nice natural environment. MOUNTAIN BIKE ROUTING Your routes for great MTB experiences! Prefers unsealed surfaces, single trails, distinguished and signposted MTB routes as well as forest and country tracks. RACING BIKE ROUTING Racing bike routes for fascinating fast trips! Prefers sealed and smooth surfaces, tracks allowing high-speed cycling, minor roads, a scenic environment. S-PEDELEC ROUTING Tailored routes for fast e-bikes up to 30 mph on roads allowing power-driven vehicles. Prefers minor roads and a nice environment whenever possible. ROUND TRIPS Just enter a start and a required length – Naviki calculates numerous alternative round trips to choose from for immediate navigation. OFFLINE MAPS Download high quality Naviki maps on your smartphone and use them independent of internet access. HEIGHT PROFILE For all routes Naviki provides a height profile, the highest and lowest points and the total altitude to be cycled upwards. SPEED PROFILE Records your speed data in the course of your trips and shows it as a graph. CONNECT FITNESS DEVICES Connect fitness devices via Bluetooth Low Energy (BLE) and see your pulse and cadence data as a graph. CONVENIENT COCKPIT Speed​​, average speed, distance traveled and distance to your target always in view. MAP VIEWS A proper map always at hand: choose between standard and bicycle map view. RECORD YOUR OWN TRIPS Just one tap and Naviki records the trip you cycle and stores it in your personal Naviki Cloud. Easily create an impressive overview on www.naviki.org! You can add an individual description to each route. MEMORISE ROUTES Plan comfortably on the web and transmit your routes from www.naviki.org to your Naviki App by just one click. TURN BY TURN INSTRUCTIONS FOR ALL ROUTES Naviki provides turn-by-turn instructions for paths of arbitrary origin, including those you recorded with Naviki. 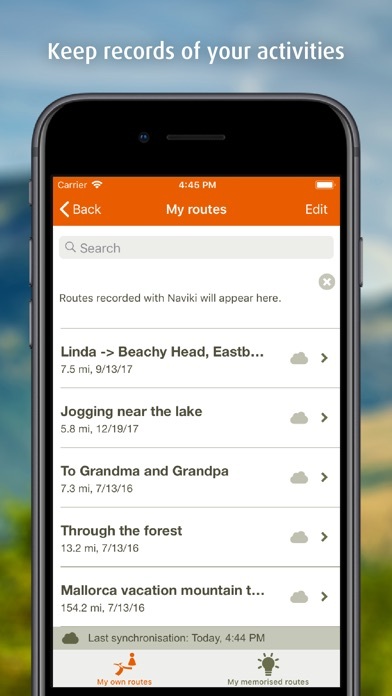 MY ROUTES Clearly arranged lists show your recorded paths and the routes you calculated via web or Naviki App. CONNECTIVITY Via Bluetooth Naviki sends the distance to the next turn and navigation arrows to the coachsmart display (www.o-synce-shop.de – saves battery power, your phone remains in the pocket). Apple Health integration on the Apple Watch app The continuous use of GPS in the background can significantly shorten battery life. Hey everyone , I did my first ride today, my trip today was roundtrip ! I choose for a trip from 50 km. That’s was great because you can manage your trip by km , it depend how much time you have for your ride ! The app send my back home 👏 . So no problem ! The app send me trough nice streets and places , always correct! I recommend option, sounds for your AirPods . Very easy if you have the watch the traffic . I saved my ride for today in the app ! So, am I happy about the app ? 👏😎 Maybe a little thing ... background music and a voice who say you how many km you already being biking every 15min ! Look forward to the updates for offline maps. Have used it cycling in France and Spain. Great turn by turn instructions. Recalculates if you wander off course. You can use their website to make a route and then transfer it to ur smartphone. I want my money back! The contact search is worthless and the map results are horribly inaccurate. I think I've been ripped off. After paying for add ons it still won't accept a route from the map and a search returns locations from all over the world instead of nearby. I want my money back! 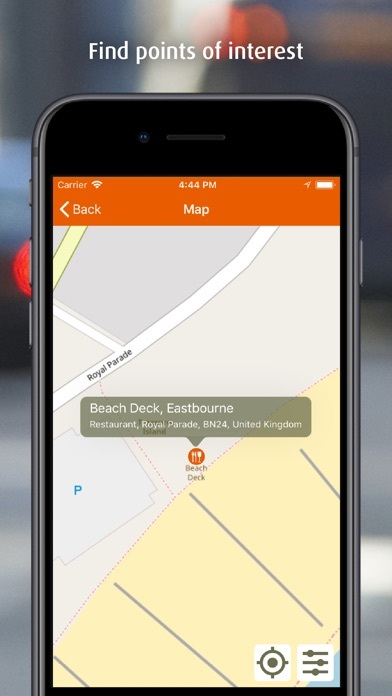 The app is free, but turn by turn navigation costs extra. It's worth it. Especially when you are riding away from home. The down side is that is doesn't recognize addresses in the United States, but all you have to do is pinpoint them on the map. Used to love this app, but the latest update crashes constantly whenever I press "calculate". Unusable like this - please fix ASAP!